Over Labor Day weekend, Bob Suzuki and I (Jim Ramaker) led a group of seven to the Meysan Lake area just south of Mt Whitney, an inviting region of high, easily accessible, and closely spaced peaks. Team members included Eddie Sudol, Linda Sun and her very fit but non-climbing husband Harry, and Louise and Jim Wholey, an amazingly strong couple in their 60s. We left Whitney Portal around 10 a.m. for the short (5 miles) but steep (3600' gain) hike to Meysan Lake. By the way, if you're looking for a scenic Sierra dayhike with plenty of elevation gain, Meysan Lake is ideal, with a well-maintained trail rising at an even grade through nice timberline forest with an abundance of granite walls and scenic views along the way. We passed several small lakes and arrived at the north end of Meysan Lake at 3 p.m., leaving plenty of time for naps, much appreciated by some of us because of the 11,500' altitude. Meanwhile, Jim W. broke out his fishing rod and caught the first of many brook trout he would haul in during the weekend, providing much of the evening fare for himself, Louise, and anyone else who wanted some. Saturday morning we rose in the dark at 5:30 a.m. and departed at 6:40, heading for McAdie (13,799') with perhaps Irvine (13,780') as a bonus. We climbed the long class-2 gully at the southwest corner of the lake, hidden from camp but obvious once you hike south a ways on the west side of the lake. This gully takes you to the high talus basin between Irvine and Mallory, where we took a break at 9:30 and decided, based on the clouds overhead and the possibility of rain, that we should bag Irvine first to ensure that we got at least one peak for the day. Forty minutes of easy boulder-hopping took us to the top of Irvine, where enthusiasm for McAdie began to wane, since it required a tedious 800' descent to Arc pass, a challenging class-3 climb and descent, and then reclimbing the 800'. After a long break, Bob and Eddie decided to head back to camp via an experimental route down the northeast gully or Irvine, while Linda, Louise, Jim W, and I headed for Mallory (13,845'), beckoning to us half a mile to the south across the talus basin. Easy boulder hopping with a bit of class-3 at the end took us up to what looked like a knife-edged ridge, but crossing its crest, we stepped onto class-1 scree on the other side -- a nice surprise. We topped out at noon, had lunch, then headed back to camp via the gullies at the south end of Meysan Lake. There are five of these gullies, and looking up at them from the lake, #1 and #5 are steep and a bit ugly, #2 is short with smooth class-3 slabs, and #4 is the gentlest and easiest. Unable to see down them from above, I led us down #3, which had several short sections of steep frozen snow at the bottom. After some meandering, we managed to find a safe way down, though at one point I nearly resorted to the cave-man trick of using a sharp, hand-held rock as an ice axe. As on the day before, we arrived in camp around 3 p.m., leaving plenty of time for naps and/or fishing. In terms of altitude headaches and related ill-effects, there seems to be a big difference between spending your second day in the mountains between 11,500 and 13,800', as we did, compared to say, camping at 10,000 and climbing up to 12,000 or so, as on a typical Yosemite-area trip. Sunday we got up at 5:30 again and headed off for LeConte (13,845') and Corcoran (13,714') at 6:30. We took Gully #2 at the south end of the lake -- I found the downsloping slabs on its right side a bit sketchy early in the morning, while the others found an easier way on the left. By 9 a.m. we were taking a break on the scree just below the north face of LeConte, along with three guys from a CMC group who had joined us on the climb. 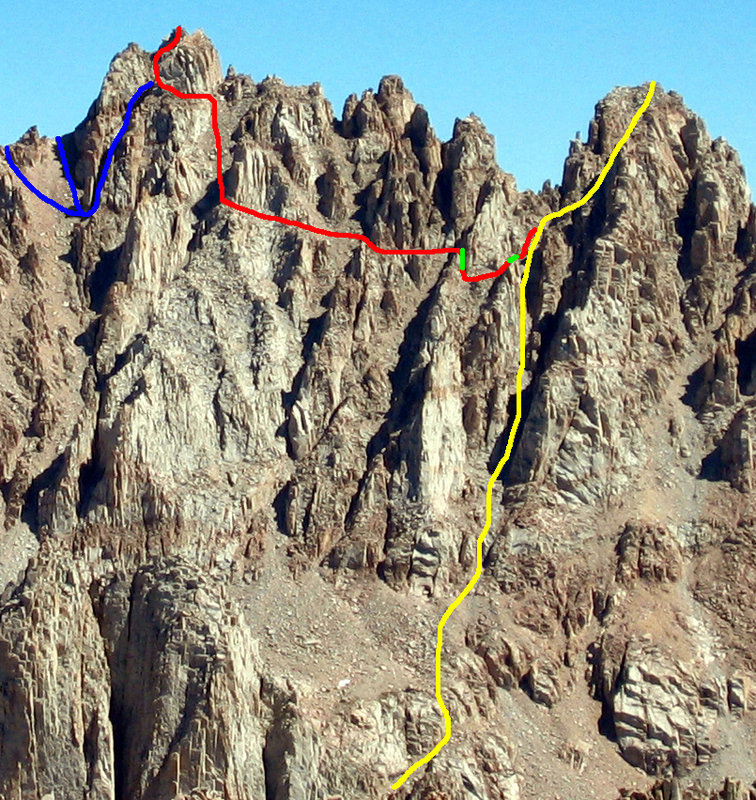 Instead of going over the pass and doing the waterfall route, the plan was to find the class-3 route on the north face, as described in David Harris' trip report from 2001. Looking up from below, it seems inconceivable that such a route exists. The near-vertical north face has a smooth, 45-degree downsloping shelf about halfway up, with a huge dropoff below it. Along the top of the sloping shelf is a faint line resembling a pencil line on the wall of a room. That's the route, and after going left a few hundred feet and fading out, the pencil line connects to some cracks heading up and right. Bob led off, and amazingly, the pencil line was actually a little hidden sidewalk a foot or two wide. Bob found the easiest spot to traverse over to the cracks heading up and right, and this traverse is the hardest spot on the climb, with loose rock underfoot and the void yawning below. It's still class-3, with plenty of holds, but don't fall. We climbed up the cracks for 100' or so, then traversed left a second time to get into the gully heading up toward the summit. After climbing up another 100', we traversed left a third time to finish the climb on the east ridge of LeConte. After a break, we descended the northwest gully toward the waterfall pitch, parted with the CMC guys, and headed for Corcoran at 11 a.m. The traverse to Corcoran is a miracle of geology and routefinding. Starting with the waterfall gully, you cross no fewer than eight gullies, all of them clearly visible in Steve Eckert's photo of the route. On most of the route, you'll find dizzying drops below you and steep walls and towers around you and above you, but at your feet you'll see class-2 scree about 90% of the time. And the other 10% is never harder than moderate class-3. It's pretty amazing -- the easy climbing actually helps you stay on this complex route, because if you encounter any hard climbing or big air, you know you're off route. The notes I took during the climb are below. Each gully is defined by a distinct rib that completely blocks the view into the next gully, and of course, the key to the route is finding the right spot to cross each rib. About half of the crossings were well-marked with ducks and we added more, but of course, ducks can mislead you or be swept away by winter snows. Gully #1 is the gully with the waterfall pitch. Gully #1 -- About 50' above the waterfall pitch, traverse left on a high ledge and cross into Gully #2. Gully #2 -- Descend 50' on ledges, then descend another 200' down the gully. Cross into Gully #3 just below a smooth cliff. Gully #3 -- Traverse level for about 100'. Gully #4 -- Descend a narrow slot and some airy ledges into Gully #4, which is a double gully because you traverse across the bottom of a rib that divides the gully just above you. Traverse level for about 300'. Gully #5 -- Traverse level. Gully #6 -- Descend 30' in another narrow slot into Gully #6, which has two large windows in the south wall, just below the traverse line. Traverse a bit and then climb up 50' on class-3 ledges. Gully #7 -- Descend 30' into Gully #7. This is the key gully to recognize because climbing it takes you to the summit, whereas climbing an earlier or later gully will lead to major disappointment. This gully has a huge tower just below the traverse line on the north side, and another tower on the skyline high above you with an overhanging rock on top of it. Climb Gully #7 all the way up to the North Notch, from where you can look down the east face. Gully #8 -- Traverse into Gully #8 and climb 200' of easy class 2-3 to the summit of Mt. Corcoran. The traverse took less than two hours, and by 1 p.m. we were looking for familiar names in the summit register. Reversing the route was fun and went quickly. Some black clouds drifted in from the northwest, but we heard no thunder and felt only a few drops of rain. Back at the top of the waterfall pitch, we did not emulate our friend Arun Mahajan on the 2001 climb, who first dropped his pack down it, then figured out how to downclimb it. Instead, Bob set up a double rope to use as a handline. This sounds dubious but actually worked well, with the rope providing a secure handhold for one hand at all times. "Waterfall pitch" is too grandiose a name for this section -- the vertical part is only about 12' high, but it does have poor holds, and a fall from the top of it will get you injured. From the bottom of the waterfall gully, we climbed 100' back to the saddle where we had started seven hours earlier. Avoiding my mistake of the day before, I led the team down the tedious but low-angle boulders and scree of Gully #3 to the south end of Meysan Lake, and by 5:45 we were back in camp listening to more tales of successful fishing from Jim W. Eleven hours for a really fun day of climbing on two fine peaks that I would gladly climb again. On Friday, Louise and Jim W. climbed Lone Pine Peak, while the rest of us hiked out to get an early start on the long drive home in Labor Day traffic.